My favorite time of year is fall, and my absolute fave holiday has always been Halloween. Maybe it's because I'm a Libra, or because I loved playing dress up when I was little, but regardless, I'm a total All Hallows' Eve STAN! It's a night of tricks and treats, but don't just call it a day with a bowl of candy. Your cocktail game needs to be v on point, truly reflecting the magic and witchery around you. Fear not! 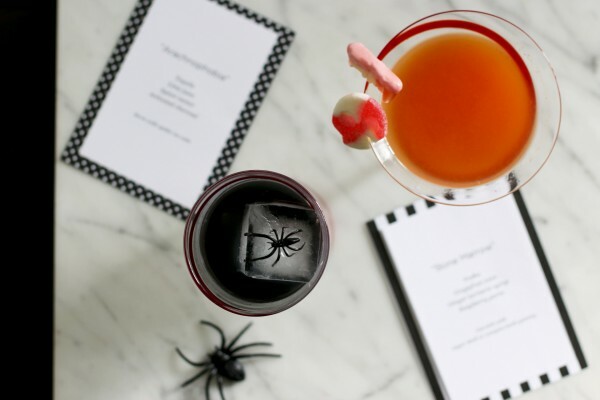 I have two crowd pleasing cocktails that are easy to make and perfectly aligned with a night of frights. You can even make them in bulk and have them in vessels, leaving more time for hoots and haunts! In a glass, muddle one 265mg capsule of activated charcoal thoroughly extracted. Combine remaining ingredients (except spider) in a shaker filled with ice. 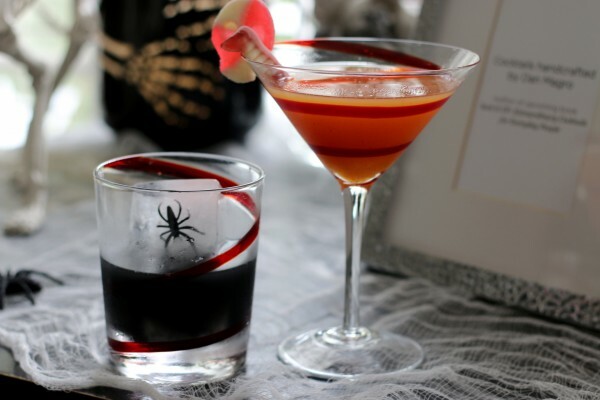 Shake vigorously and strain into a rocks glass filled with one large spider ice cube. *To make the spider ice, simply freeze a washed plastic spider in a large ice cube. -Plastic spiders are not to be consumed, and can be a choking hazard if not securely frozen in large ice. 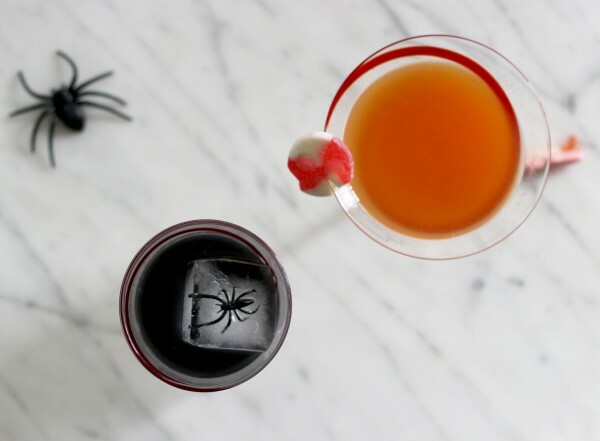 Don't use small cubes as the ice melts faster, and the black spider will be hard to see in the darkness of the cocktail. -Activated charcoal can, in certain circumstances, absorb medication's active ingredients (such as birth control) before your body gets a chance to. Consult your doctor if you are on regular medication of any klind before consuming activated charcoal. In a glass, muddle raspberries with the vodka until thoroughly extracted. Combine remaining ingredients (except gummies) in a shaker filled with ice. Garnish with skeleton or white bone gummy. “Take roughly ¼ cup of ginger root and wash it thoroughly, leaving on the skin. Place the ginger in a blender, along with 2½ cups of water, and blend until smooth. Strain the liquid into a stove pot, removing any pulp, and add 2 cups of cane sugar. Bring the contents to a boil and add 2 tablespoons of turmeric, then reduce to a simmer, stirring until dissolved. Let cool, keeps for 2 weeks in the refrigerator. Have fun, celebrate responsibly, and let's not forget the *only thing* you should be TRULY be frightened of this season –– a gnarly hangover.